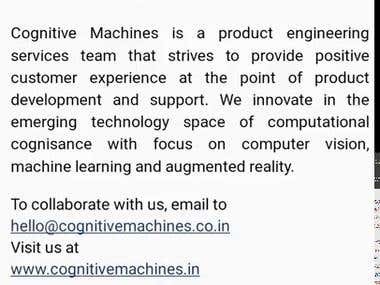 I am a freelance consultant focusing on development of computer vision products. I have work experience of over 16 years in this field. In the past, I have worked on face detection, object detection, object tracking, optical character recognition, number plate recognition, back ground segmentation, point cloud, 3D reconstruction etc. Most of my work revolves around computer vision libraries like OpenCV, VLFeat, Scikit Image, ITK, VTK, Tesseract etc. I have immense experience in developing desktop, mobile and web applications in this domain. I usually develop mobile applications using native Android and iOS SDK. I can also develop mobile applications using cross platform libraries like Xamarin, Ionic, Qt etc. For desktop applications we use C#, WPF, Qt, Kivy etc.